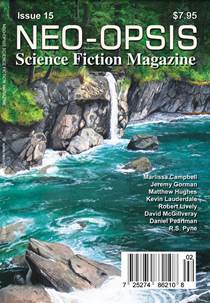 The fifteenth issue of Neo-opsis Science Fiction Magazine is 8” by 5 ½”, 80 pages. Published on September 24, 2008. A portion of Stephanie Johanson’s painting, Sombrio, was used for the cover of issue 15. If you look closely you may find a mermaid in the painting. Karl Johanson’s editorial this issue is Suffering for my Art. Karl considers the idea that one must suffer to be a great artist. Letters to the Magazine this issue are from: Jeanne Robinson (co-author of the Stardance series, related article Neo-opsis # 14), Greg Stratton, Jim Hoerner, Bob Smith, Susan Matley, Don Hayward, Kirstin Morrell, Savannah Lee (author of Kinship, Neo-opsis # 14), Gerry Curry, Lindsay Kervin, Susie Klassen, Derek Kugamann. This issue, Karl Johanson’s A Walk Through The Periodic Chart is titled My Two Cents on Zinc. Karl, in his unusual mix of fact and humour, explains some of the many uses for zinc. The first story in issue fifteen is The Laughing C’rell (4,038 words), by Kevin Lauderdale. (Illustration by Karen Elizabeth Lightbody) Kevin has written essays and articles for The Dictionary of American Biography, the Los Angeles Times, and Mcsweeneys.net. His fiction can be found in several of Pocket Books’ Star Trek anthologies. The second story is Head in the Stars (3,290 words), by R. S. Pyne. Dr Rebecca Sian Pyne lives in rural West Wales and has a PhD in Micropalaeontology. Previous fiction has appeared in Delivered, Albedo One (in press), Salt, Orphan Leaf Review, Pen Cambria, New Cauldron, Crimson Highway, Twisted Tongue and quite a few others. A non-fiction book is due for completion in 2009; this details service in the British Fleet Air Arm during WWII and draws on a family archive of 1000+ original photographs and written memoirs. This issue we have a poem, Biology 1000: That’s Life (391 words), by Jeremy Gorman. (Illustrations by Stephanie Johanson, photo by Karl Johanson) Jeremy has contributed other funny rhymes to Philosophy Now, Annals of Improbable Research, College Mathematics Journal, and CBC Radio One. His short rhyming play Pass the Glove was produced at the 2006 Notable Acts Theatre Festival. The fourth story is JA-22 (4,595 words), by Robert Lively. Robert is currently a Ph.D student at the University of Nevada, Reno. While most of his publications deal with realistic fiction, he has a strong interest in science fiction in popular culture. He has recently published an essay in The X-Files and Literature (Cambridge Scholars Press, 2007). He lives in Sparks Nevada with his wife and two sons. The fifth story is Alien Invasion (6,300 words), by Daniel Pearlman. Daniel’s fantastical stories began appearing in 1988 in magazines such as Amazing Stories, The Silver Web, New England Review, Quarterly West, and anthologies such as Semiotext(e) SF, Synergy, Simulations, Imaginings (Pocket Books, 2003). His books of fiction to date are The Final Dream & Other Fictions (Permeable Press, 1995); a novel, Black Flames (White Pine Press, 1997: a twisted excursion into the Spanish Civil War); a second fiction collection, The Best-Known Man in the World & Other Misfits (Aardwolf Press, 2001); and a science-fiction novel, Memini (Prime Books, 2003). The sixth story is The Last of Us (2,573 words), by David McGillveray. (Illustration by Karl Johanson) David was born in Edinburgh in 1972 but now lives and works in London, where he is waiting for his first baby to arrive in December. His short fiction has appeared in Neo-opsis 8, Futurismic, Fictitious Force, Read by Dawn, Coyote Wild and many others. Sam’s Dot Publishing published his first short fiction collection, Celeraine early in 2008. This issue we have a special treat, A Commentary on the Process of Writing by well-known writer and author Matthew Hughes. Matthew Hughes’ web site is www.archonate.com. Reviews this issue include: Template written by Matthew Hughes, reviewed by Robert Runté; The Heart of Valor written by Tanya Huff, reviewed by Robert Runté; Firestorm of Dragons editer by Michele Acker & Kirk Dougal, reviewed by Stephanie Johanson; Okal Rel Universe: Anthology 2 edited by Lynda Williams & John Preet, reviewed by Stephanie Johanson; Killers From Space a 1954 RKO film, reviewed by John W. Herbert; Darwin’s Paradox written by Nina Munteanu, reviewed by Virginia O’Dine. Other SF News includes that Hades Publishing is accepting submissions for Tesseracts 13, World Fantasy to be held in Calgary, and more. The Last Three Pages, Capturing a Feeling with Music 3, written by Karl Johanson, explores the way music is used to create the right or wrong mood.